Angelo Pegnato was one of a gang of safe-crackers and burglars—most of whom, like Angelo’s brother, Frank, had fought in the war—who were arrested in March, 1947, after stealing thousands of dollars from businesses in town. They took almost $4,000 from the Strouss-Hirshberg department store, and $3,360 in cash and $6,250 in war bonds from the Rick’s Motor Car office. Smaller sums were taken from Lebo’s clothing store, the Lincoln-Garfield school, the Lawrence laundry, Exide Battery and Star Lumber. They broke into safes in Fisher’s furniture store and Marchaletta’s hardware store, but found no money. One of the gang, Sammy Sams, implicated an apparently innocent man—Leonard D’Antonio—in the crimes, which led to a lengthy series of court appearances and legal complications. Angelo avoided all that by pleading guilty at once. He got a year in jail. There is no further record of Angelo’s life. He died, at the age of sixty-three, in 1983. Sources: New Castle News (7 June 1947, “Enter Pleas In Safe Cracking”; 22 September 1953, “Bartoshek Waives Case Into Court”; 23 September 1953, “Indictments Are Returned”). 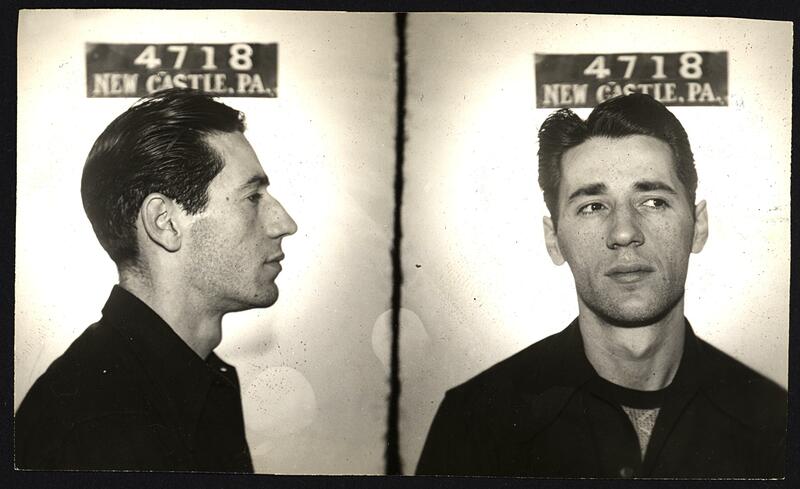 The mug shots on this site were all taken in New Castle, Pennsylvania, between 1930 and 1960, and were rescued from the trash when the town's police department threw them out. The information that has been used to reconstruct the stories behind the pictures comes mostly from old copies of the local paper, the New Castle News. The mug shots have been scanned in extra large. Click on them to see them full scale.